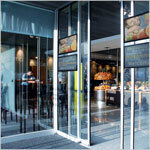 Installed at the point of entry, Gilgen's automatic sliding media door can be used as an innovative and surprisingly effective means of communication.The media door combines the already proven SLX automatic sliding door drive system with flat screen technology to produce a powerful and extremely effective communications tool, targeting customers at their point of entry as well as drawing in passing trade. Active publicity continues to exercise its effect even beyond the shop's opening hours. Gilgen automatic sliding doors have been designed for internal and external applications such as offices, retail, shopfronts, hospitals, hotels and leisure facilities. Elegant construction and design, combined with innovative control elements and technology ensures safe, convenient and reliable access. Automatic sliding doors not only make access easy for all users, but also guarantee reliable closing, creating a sense of effortless convenience together with a feeling of security. Gilgen's innovative SLX sliding door operator offers the flexibility of a wide selection of functions allowing access to be optimised to match pedestrian flow. When combined with the Gilgen PSX slim profile doors, the SLX door system offers the basis for customised automatic door operation.